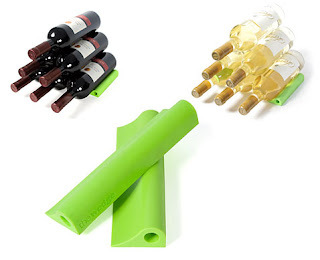 Wine Wedge - Looks neat, but traps most bottles! The Wine Wedge, available through LatestBuy (and made known through Gizmodo), seeks to minimalize wine storage by allowing pyramids of bottles to be supported by only two rubber/plastic wedges. It's true that it has a viscerally appreciable simplicity, and a perceivable power in its ability to allow pyramids stacked to any arbitrary/ludicrous heights. But it's got problems, too: what about when I actually want to drink a bottle of wine that's not on the top of the pyramid? A cumbersome disassembly-and-reassembly seems to be the only way - unless there's some trick akin to the magicians' stunt of pulling the tablecloth out from under the dishes. The recommended practice of rotating the bottles periodically during storage would seem risky, too. And finally, any pyramid made of a heterogeneous mix of bottles (rather than the identical bottles shown in the photos) might suffer structural problems if all bottles don't share the same diameter. Good lookin' design; good luck using it! I could see this at Olive Garden or some restaurant that has a lot of one type of wine. That way the bottle on the bottom is the same as the top.